Click on the image to the left to hear an animation that describes the cell cycle and its regulation. 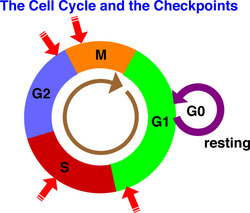 The red arrows indicate checkpoints - similar to stoplights - where cyclins bind to cyclin-dependent kinases that regulate when and whether the cell should proceed to the next phase of the cycle. 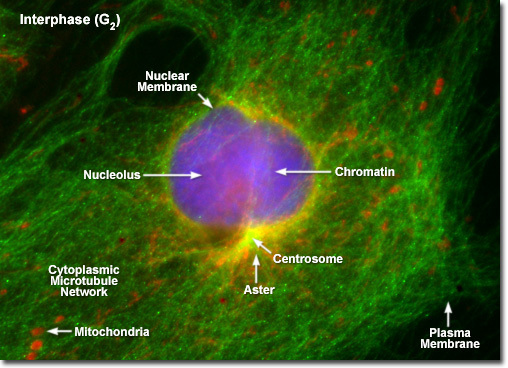 Between mitotic divisions, a normal resting or actively growing cell exists in a state known as interphase, in which the chromatin forms a highly diffuse, fibrous network that is being continuously transcribed by enzymes within the nucleus. 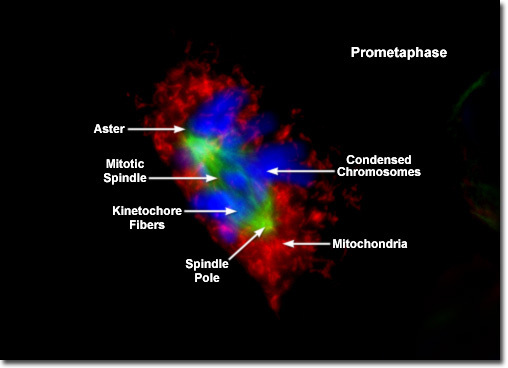 Before the cell enters the mitosis sequence, it first undergoes a DNA synthesis (or S) phase where each chromosome is duplicated to produce an identical pair of sister chromatids joined together by a specific DNA sequence known as a centromere. 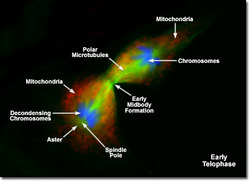 Centromeres are crucial to segregation of the daughter chromatids during mitosis. _ The first stage of mitosis is known as prophase, where the nuclear chromatin starts to become organized and condenses into thick strands that eventually become chromosomes observable in the optical microscope. The nucleoli, primarily responsible for the production of ribosomal RNA, begin to disappear as the chromosomes condense. 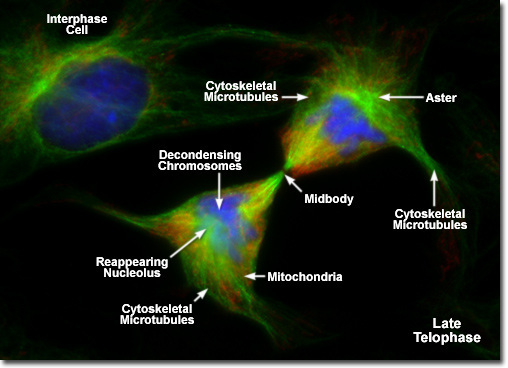 During prophase, major changes also occur in the cytoplasm, including disassembly of the cytoskeleton components based on tubulin (cytoplasmic microtubules). 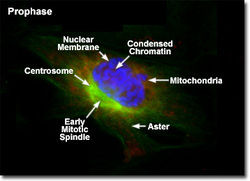 The tubulin monomers are dynamically redirected by the dividing cell to form the main component of the mitotic apparatus, the mitotic spindle, which is bounded by the centrosomes and begins to appear along the periphery of the nuclear membrane. 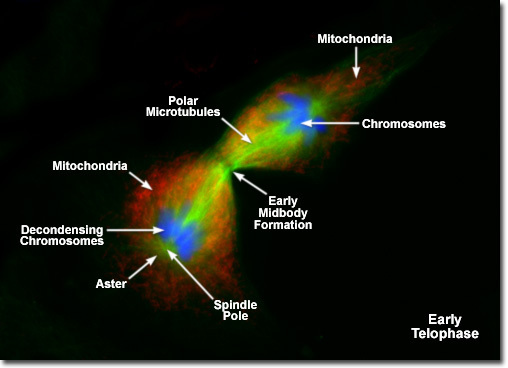 _Perhaps the most recognizable phase of mitosis is termed metaphase, a stage where the chromosomes, attached to the kinetochore microtubules, begin to align in a single plane (known as the metaphase plate) midway between the spindle poles. 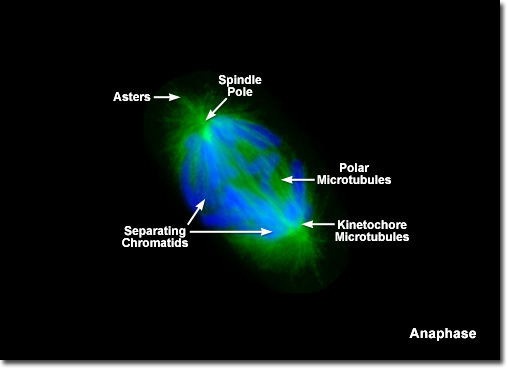 The kinetochore microtubules exert tension on the chromosomes, which move back and forth in rapid erratic motion as a result, and the entire spindle-chromosome complex is now ready for the next event, separation of the daughter chromatids. 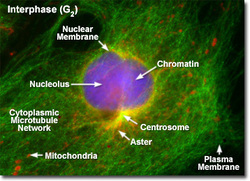 Metaphase, one of the most critical stages in mitosis, occupies a substantial portion of the division cycle. The primary reason for this extended interval is that dividing cells pause until all of their chromosomes are completely aligned at the metaphase plate. 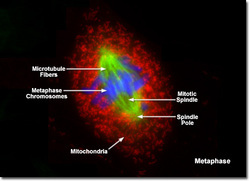 Almost immediately after the metaphase chromosomes are aligned at the metaphase plate, the two chromatids from each chromosome are pulled apart by the mitotic apparatus and migrate to the opposite spindle poles in a process known as anaphase. 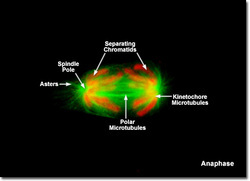 The kinetochore microtubules shorten as the chromatids are pulled toward opposite poles, while the polar microtubules subsequently elongate to assist in the separation. Anaphase typically is a rapid process that lasts only a few minutes, making it the shortest stage in mitosis. _In telophase, the daughter chromosomes arrive at the spindle poles and are eventually redistributed into bulk chromatin. 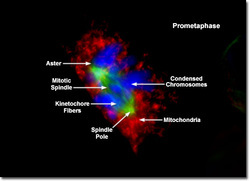 Individual chromosomes begin to decondense back into chromatin at this stage and start to become less clearly defined. 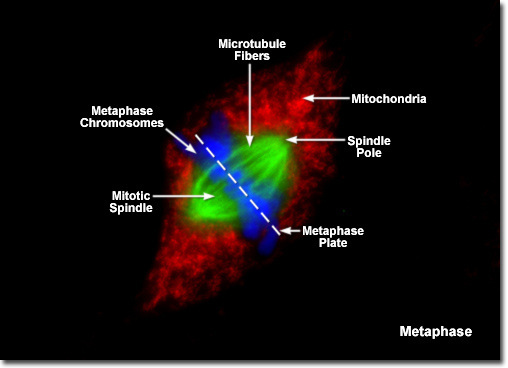 Polymerized microtubular networks that formed the mitotic spindle during metaphase and anaphase are redistributed into cytoskeletal components, and RNA synthesis commences once again in the nucleus. 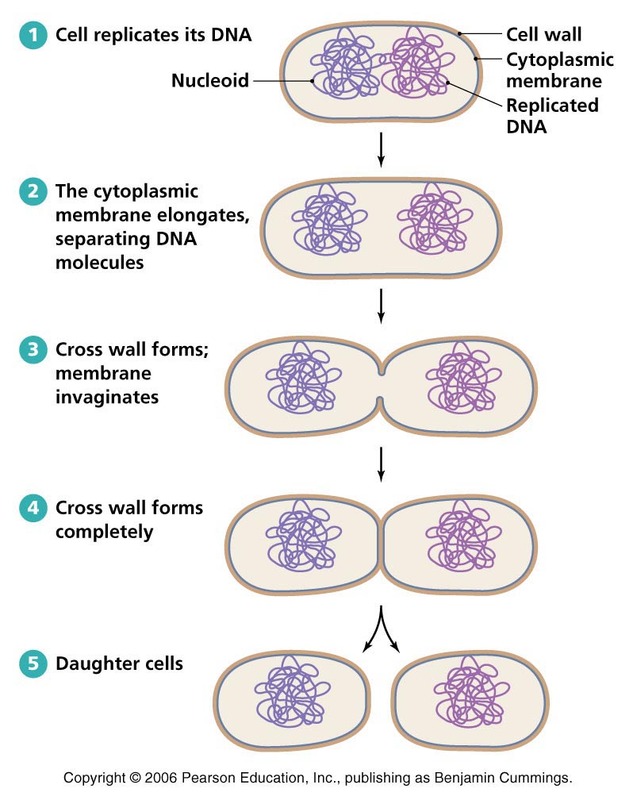 The process of cytokinesis, where the cytoplasm is divided by cleavage into two daughter cells, also starts sometime in late anaphase and continues through telophase. _The final stage in the process of cell division is known as cytokinesis, which usually begins during late anaphase or early telophase (before mitosis ends) as the nuclear envelope and nucleoli are reforming and the chromosomes are de-condensing. 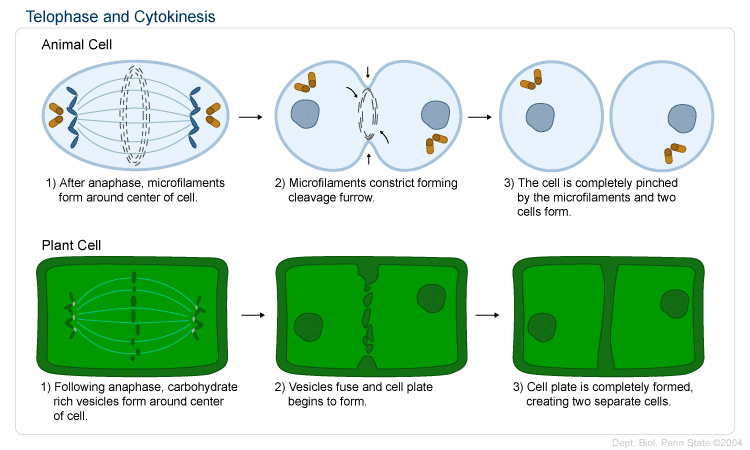 During cytokinesis, the cytoplasm divides by a process termed cleavage, driven by the tightening of a contractile ring composed of actin and myosin protein subunits. As the ring of cytoskeletal proteins contracts, a cleavage furrow is formed perpendicular to the mitotic spindle and gradually splits the cytoplasm and its contents into two daughter cells. This is the website where we looked at actual onion cells to identify the stages of the cell cycle. Why are there so many cells in interphase? 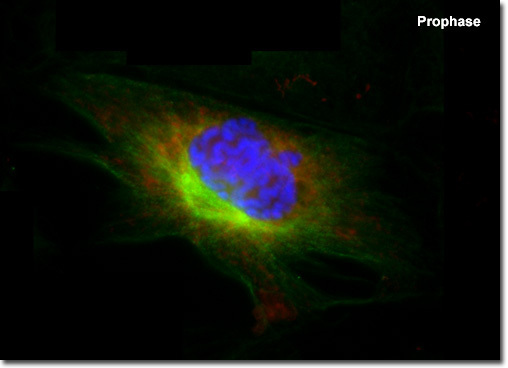 Where would you expect to find more cells undergoing mitosis? Click on the picture to test your observational skills and find out the answers to these questions. Click on the image for instructions on how to stain onion cell nuclei so that you can visualize the different stages of mitosis. Click on the picture to go to the website. Follow the instructions on the worksheet. 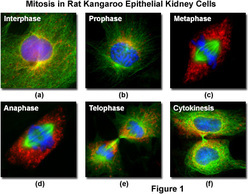 Cell cycle & mitosis tutorial - test your knowledge! 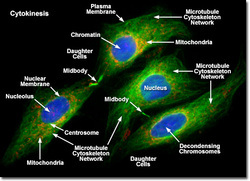 Click on these links to a website that explains DNA basics , the cell cycle, and mitosis. Then test your knowledge with this last link. Plants, animals and bacteria divide differently. Click on this link for a video that distinguishes between them.